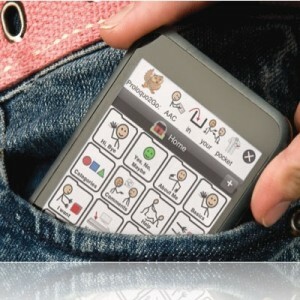 Apps: A Breakthrough for Autism, Too? Autism spectrum disorders now affect roughly 1 in 110 hundred children in the United States, according to the Centers for Disease Control and Prevention. Difficulty communicating with others, reading facial expressions, and interpreting social situations are just a few of the symptoms of the disorder. Enter the app world. Children with autism -- and their families -- are celebrating yet another use for the ubiquitous technology: Apps that help them learn. Proloquo2go, for instance, is an application for iPad, iPhone, and iTouch that includes a text-to-speech feature, a large-lettered typepad, and a default vocabulary of over 7,000 symbols that the user can create messages with (the cartoon symbol for "see you later" is a face, a clock, and an arrow, for example). At Carney Academy in New Bedford, Mass., an iPad app that uses a lively crab character helps an autistic 5-year-old trace her ABCs with a finger -- a far more hands-on, individualized interaction than is possible in a typical classroom setting, her teachers say. AutismXpress is an app designed specifically for those with autism to learn about, identify, and express emotions like "angry" or "hungry" or "nervous" through colorful emoticons. Dragon Dictation is a quick and easy voice-recognition software that helps kids "write" down their thoughts. Tom the Talking Cat repeats what you say, exactly how you say it, which is helpful for autistic children learning about sound, language, and self-expression. Parents are praising the apps, and based on anecdotal success, developers are exploring and designing even more targeted software. Along with all these heartfelt stories, we might see some scientific backing, too.